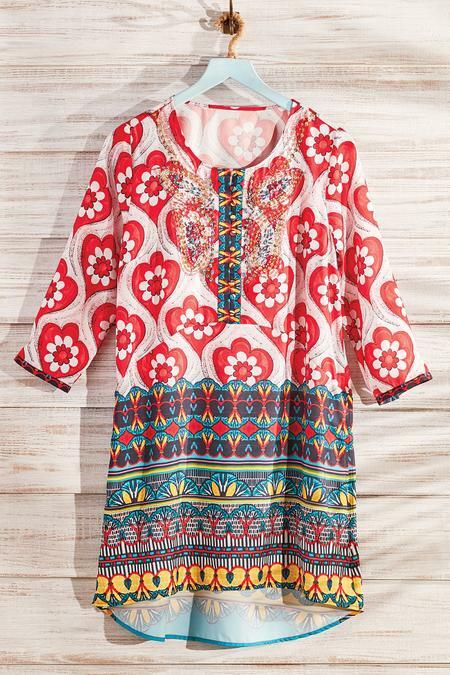 Colored beads, sequins, even rhinestones embellish the neck and bring sparkle to the boldly colored bodice of this free-spirited tunic. A contrasting placket (with modesty inset) echoes the bottom border, inspired by exotic Moroccan tile. With 3/4 sleeves, on-seam pockets and high-low hem. Poly. Misses 32"/36" long.